Graphing in Google Sheets is an “intro to spreadsheets” skill my kiddos learn early in the school year. 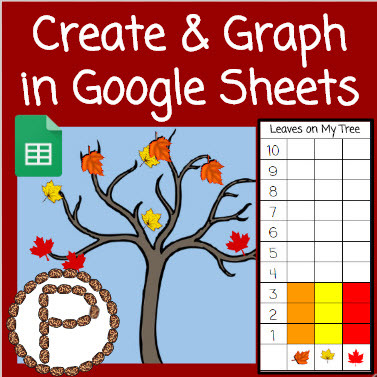 I have designed several activities that involve the kids manipulating a Google Drawing inside the spreadsheet, and graphing their results according to their image. This particular activity allows kids to choose which items and how many of each item they want in their image. When designing activities for Littles I ask myself what choices do my kids get to make during this activity? Are their completed assignments going to look the same? The answers to those questions are indicators to me if I need to make changes before going further with the design. The kids can type any text in the graph for the cell to change colors. The spreadsheet has conditional formatting in those columns. The kids are practicing so many skills from sorting, to graphing, to reading and completing the sentences on the side. These skills expand as the year goes on and so should the activity. A combination of consistency with a little bit of an extension helps kids work independently and apply new skills. For example, in the winter the kids still manipulated the Google Drawing to create an image and graphed, but went a step further in typing equations to go along with their data. The Google Drawing for this activity will not work on a tablet. Double click (two times fast) to open the Google Drawing. Be sure that students click the blue save and close button when they are done with the Drawing. “I saved it but my picture looks the same.” Have the kids click on the refresh button. This entry was posted in Chromebook, Google Sheets, Kindergarten, Math, spreadsheets, Template by Christine Pinto. Bookmark the permalink.